Linnaeus Tripe (1822–1902) documented much of south India as official photographer to the Madras government (1856–1860). Tripe set off on a tour from Bangalore on 14 December 1857. He travelled through the Salem district to Srirangam, Tiruchchirappalli, Madurai, then Pudukkottai, Thanjavur, and Tiruchchirappalli again and ended his tour in Madras on 30 April 1858. 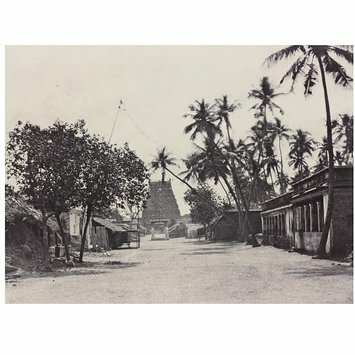 This photograph is part of the album he produced of Seringham, or Srirangam. The last three prints in the album show the Sri Jambukeshwara Temple, near to the main temple complex at Srirangam. The temple is dedicated to the Hindu god Shiva and has five concentric walls and seven gopurams, or gateways. 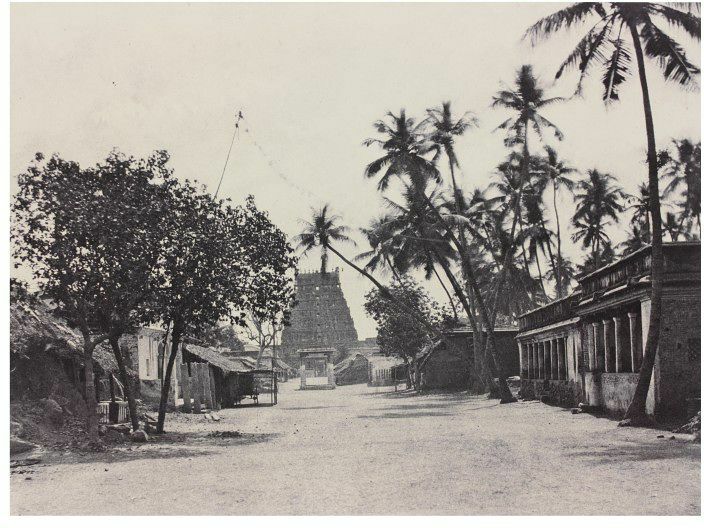 This photograph shows the west gopuram in the distance, behind the blurred palm trees moving in the wind. 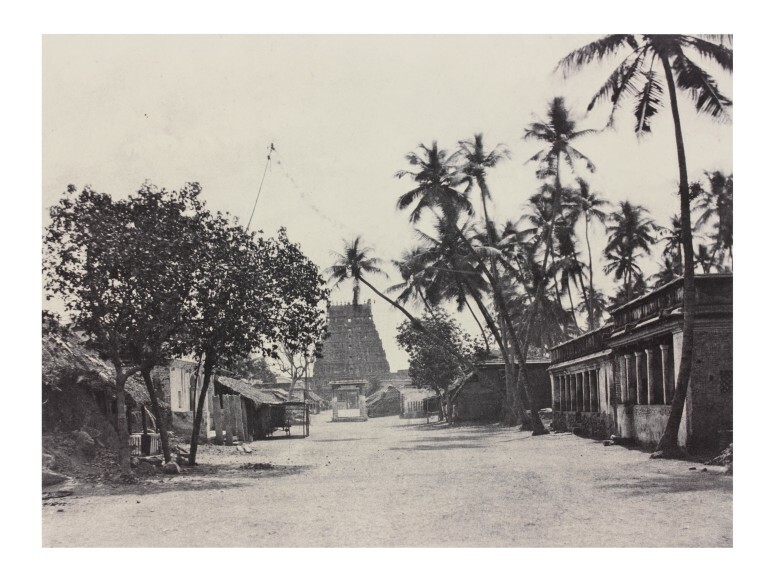 This black and white photograph shows a dusty road, with trees on the left and right, and a gopuram (gateway to a Hindu temple) in the distance. This photograph was given by Lady Denison in 1889 during the keepership of Caspar Purdon Clarke, Keeper of the Indian Section of the V&A. It was written off in 1937, and rediscovered and re-evaluated in the 1990s. See Dewan p.388 for listings of other copies elsewhere. This photograph was published as plate VII of nine in the album Photographic Views of Seringham 1858, by 'Captain L. Tripe, Government Photographer', published in 1860. It was taken as part of Tripe's remit as the government photographer, which he himself defined broadly, as recording, ‘before they disappear’ buildings, sculptures and inscriptions…' including the picturesque. This was a model for an extensive survey, including tuition of others and experimentation in his own practice. He was funded by the Madras government, but intended selling additional copies of some prints so that his practice could be self-funding. Unusually, the prints in this album were published without any accompanying text. Dewan, Janet. The Photographs of Linnaeus Tripe: A Catalogue Raisonné. Toronto: Art Gallery of Ontario, 2003, p.388. Edition number unknown. The album of which this photograph is part was one of between 37 and 39 copies to have been produced.